The long lines and packed house confirmed DeLillo’s status as a Sphinx-like godhead for fiction writers of Franzen’s age and younger, but several women sitting behind me, most likely writers themselves or employees of DeLillo’s publishing house, cut through the reverent atmosphere before the principals had even taken their seats. As a still of a Salman Rushdie interview from the same venue appeared on the screens bookending the stage, one woman sighed: “Ugh, he’s so self-absorbed.” One of her friends echoed that Franzen, too, was fatally narcissistic (“and it’s always with this victim thing”). A third laid into Michael Chabon (“He’s annoying—so stylized. But have you read his new novel? It’s brilliant, if annoying.”) I started to worry that they were going to train their fire on novelist friends of mine when, thankfully, Paul Holdengraber introduced DeLillo. A word about author photos: During my lifetime they have mutated from awkward space fillers on dust jackets—with the author, usually not the possessor of Adonis DNA, attempting to bolster his intellectual bona fides with a hopelessly staged hand-on-chin or glasses-in-mouth gesture—to completely fraudulent embellishments of the author’s unremarkable appearance. Franzen’s author photo for the first edition of The Corrections (2001)—Superman disguised as Clark Kent as made over by stylists at GQ—was a bellwether of this trend. DeLillo, to his credit, has used the same author photo for the past thirty years, and it ain’t pretty. It’s a lived-in face, the face of a man who has spent decades marinating in pain. And indeed, that is exactly how he looks in real life. DeLillo read from his first-ever story collection, The Angel Esmeralda, which collects short work from 1979 through last year. The chosen story for the evening was a science-fiction–flavored piece from 1983 about men on an orbiting wartime spaceship, practicing maneuvers and trying to stay sane. Its title is “Human Moments in World War III.” DeLillo hails from the Bronx, and therefore pronounces “human” as “yooman.” Recurring references to “human moments” throughout the story were charged with unintentional yoomor because of this. When DeLillo finished, Franzen entered from stage right, bearing a briefcase from which he removed pages of questions. He said that DeLillo meant more to him than any other writer. DeLillo’s eyes widened. Left: Jonathan Franzen. Right: The New York Public Library's Paul Holdengraber. In the audience Q&A segment, an earnest young writer asked DeLillo to elaborate on his recurring theme (most explicitly treated in Mao II) that terrorism had replaced writing as the primary means of cultural communication. DeLillo feinted, saying those were the characters’ thoughts, not his. “Really?” Franzen interjected, adding that DeLillo’s demurral reminded him of an interview with Pavement’s Stephen Malkmus, where the songwriter corrected his interlocutor on the line “Attention and fame’s a career,” saying that the repeated “career” was actually “Korea” (pace Franzen and Malkmus, but it’s both, one word transforming into the other—oblique wordplay typical of the singer). Someone else asked about the future of the novel. DeLillo, pointing to Franzen, said, “He’s the future of the novel.” Maybe so, but if he wants to have a long Korea as such, he’ll have to stop worrying so much about meaning and learn to be coy when interviewed. I don’t often agree with literary critic James Wood, but his charge that Franzen and some of his literary peers are “overexplainers” seems apt here. It’s hard to continue the striptease when you’re already naked. 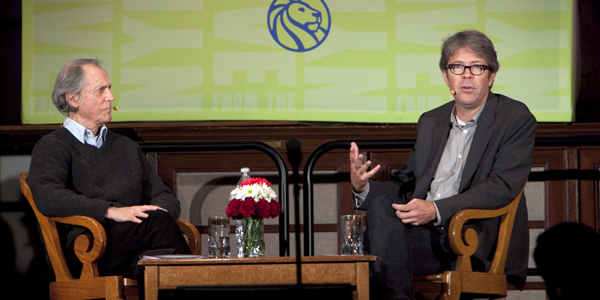 We learned a few things about DeLillo in this conversation, but far more about Franzen. Perhaps the opposite was intended.